Gambia's President: My "Cure" For AIDS Makes Me Like The Prophet Mohammed - Joe.My.God. “Who am I to expect that everybody would praise me? Just as the Prophet Mohammed prevailed and established Islam, I also prevailed to cure HIV/AIDS to the point that 68 are being discharged today.” – Gambia president Yanya Jammeh, responding to criticism from AIDS activists who say Jammeh’s ridiculous “herb cure” is prompting HIV patients to cease taking their medications, leaving them open to infections and death. RELATED: In April this year Jammeh said Gambia didn’t need foreign aid if that money was contingent on him ending the persecution of LGBT Gambians. 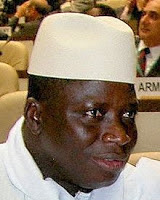 In 2008 Jammeh announced that he would “cut the head off” any homosexual found in Gambia. He then ordered all gay people to leave the country because his anti-gay laws would be “stricter than in Iran.” Jammeh has multiple wives but the exact number is not known.